Free themes made for Wordpress.org. Do you like black color? Many web developers do, as it suits almost each and every design topic. Moreover, black goes well with all other color hues. 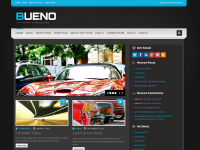 Duena Bootstrap template possesses all design and functional features any personal blog can dream of. Most of web developers are well acquainted with extreme Bootstrap flexibility, simplicity of use and multiple opportunities for customization.